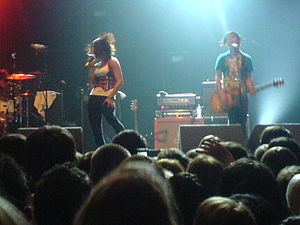 Hey Monday is an American Pop rock band. The band is from West Palm Beach, Florida. The band members are Cassadee Pope (lead vocals), Michael "Jersey" Moriarty (bass guitar), Mike Gentile (lead guitar), Alex Lipshaw (rhythm guitar) and Elliot James (drums). This page was last changed on 27 August 2018, at 10:10.